Vetrofen Pet by animalife is a carefully formulated supplement containing a completely natural antioxidant blend that targets comfort and recovery. Vetrofen Pet has been scientifically formulated to help dogs and cats when they require support in dealing with the natural ageing process and recovery during everyday life. Vetrofen Pet is safe to use on all dogs and cats and does not contain NSAIDs or Devil’s Claw. Vetrofen Pet is a proprietary blend of Scutellaria baicalensis and Acacia catechu. These plants have been used in foods and health products for thousands of years in other countries, especially in Japan and China. The two key ingredients in Vetrofen Pet have been studied extensively around the world and are recognized for their ability to support the body’s natural inflammatory response as well as being potent antioxidants and free radical scavengers that are fast acting, effective and safe. 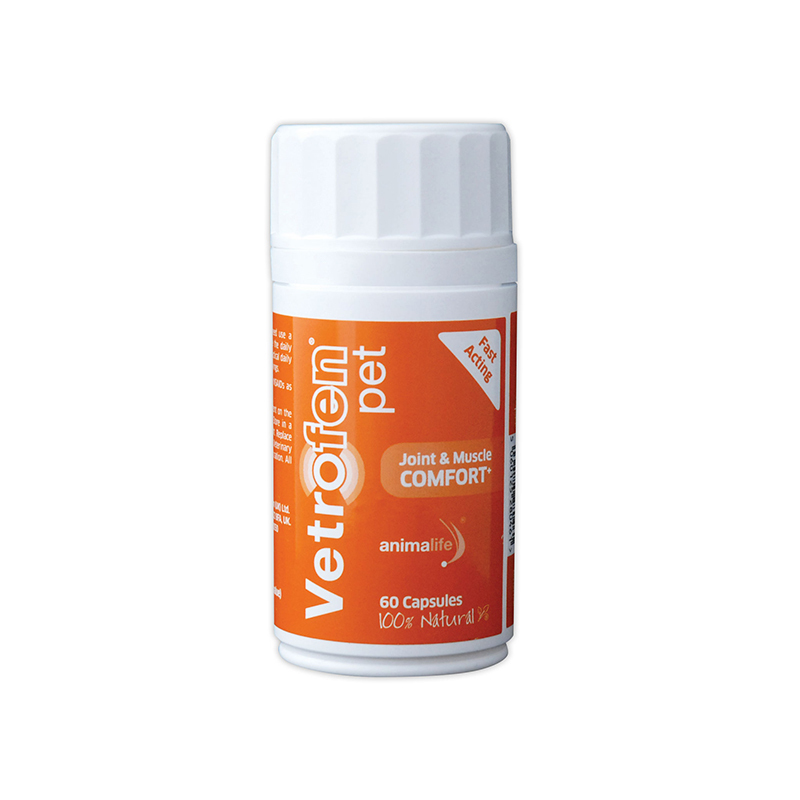 Vetrofen Pet represents a whole new approach to managing comfort and mobility by uniquely addressing the dietary balances of the metabolic processes involved. Supports comfort, function and flexibility in joints, muscles, ligaments and tendons that can all detract from optimum health. Promotes overall wellbeing and quality of life of your pet like no other product. Great for keeping the active or ageing pet comfortable, happy and mobile. Supports the body’s natural recovery mechanism.